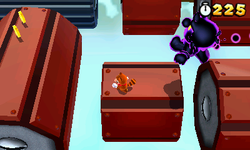 Special 8-5 is the fifth level in Special 8 in Super Mario 3D Land. It is based off of World 7-Airship. The player starts off on an Airship next to some rotating platforms. These lead to an Airship, with several Brick Blocks on it, which has another section of rotating platforms next to it. After this section is another Airship that leads straight into another rotating platform section that leads to the Airship with the Goal Pole on it. Star Medal 1: The first Star Medal is behind some Brick Blocks on the second Airship. Star Medal 2: The second Star Medal is floating above a platform of Brick Blocks. Star Medal 3: The third Star Medal is floating above a rotating platform near the end of the level.